We’ll kick things off with a sweet treat. Coach Poppy contains not one, but three unusual food notes. In the top notes, a bite of crisp cucumber lends clarity and freshness. In the heart, a vanilla-laden crème brûlée accord envelops the skin in sweetness, before a marshmallow accord in the drydown rounds off the light and fluffy fragrance. This fragrance is inspired by the scent of freshly cut vegetables and wooden rafters warmed by the summer sun. For the scent, Christopher Brosius was inspired by his own tiny kitchen on his family’s farm, which has retained the aroma of two centuries worth of cooking. 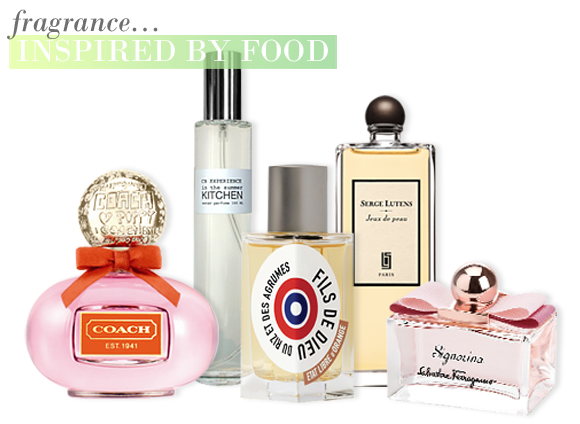 This is a very foody scent which emulates the true fragrance of vegetables. One of the many inspirations for this new Etat Libre d’Orange scent was Thai cuisine, and from the first sniff this is very apparent. The key composition revolves around lime, ginger, coconut and rice notes, which ideally reflect Thai food culture, together with spiced notes of cardamom, coriander and shiso. A zesty yet creamy fragrance with added bite. One of the most comforting smells in the world, according to Serge Lutens, is the smell of freshly baked bread. In this composition a finely crafted bread note takes center stage, while notes of spices, liquorice, immortelle and amber evoke the warmth of a freshly baked loaf. Added woody notes evoke the toasted aroma of the bread, making for an intriguing sensorial experience. My last pick is another sweet scent, the brand new Salvatore Ferragamo Signorina. This fragrance unveils its gourmand surprise in the drydown, after the more conventional notes of currants, pink pepper and jasmine: a creamy and joyful pannacotta note, which lends a sweet vanilla character. This scent is so wonderfully creamy that is smells almost like an ice cream sundae. I adore this scent but it won't be to everyone's taste. To my nose, most contemporary perfumes are way too shouty. Jeaux de Peau doesn't do predatory - it's playful and secretive - but less appealing when overdone. Used with discretion, it stays close to the skin - toasty, a little bit naughty and...inviting. Serge Lutens calls it a remedy for solitude. The bottle offers choice of spray or splash. I find that spraying has a negative effect on the smell. For me, this scent is best when dabbed and less is definitely more. This entry was posted on Wednesday, May 2nd, 2012 at 8:30 am and is filed under Fragrance, Special Post, Spotlight On. You can follow any responses to this entry through the RSS 2.0 feed. You can skip to the end and leave a response. Pinging is currently not allowed. I’m late to this post but the Serge Lutens one sounds incredible!